jealkb was founded in 2005 by singer Haderu and drummer Elsa who are, to this day the main composers and writers. Their first single Metronome was released in May 2006. It sold out on its first day of sale and managed to hit the number 1 spot on the Oricon Indies chart. After the release of several other singles and their first full length album ROSES, jealkb signed a major contract with Columbia Music Entertainment. 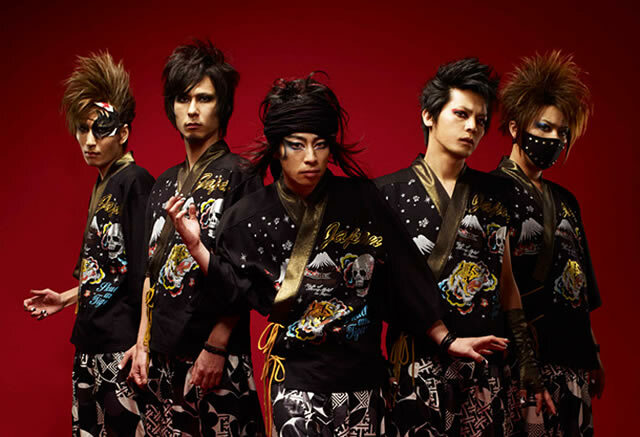 The single Chikai, released on October 31st 2007, was their major debut. In that year they also held their first overseas live in Taiwan, which was a very successful one for the group. In the summer of 2008, the young group released their first live DVD called Fuyubara no chikai at ZEPP Tokyo 2008.01.26. Japanese fans were rewarded for buying this by receiving prizes. One of these were backstage passes to meet jealkb in their dressing room and have a picture taken with the group. Then in late 2008 the second album NOROSHI was released, followed by a nationwide tour called Jealkb LIVE TOUR 2009 – Noroshi bara no yoru. During the summer event Jack in the Box 2009 fans were surprised when a band appeared on stage with jealkb’s dunch as its bassist. This project is called karasu, and accompanying dunch there is ayabie’s Kenzo, Sadie’s Mizuki, Alice Nine’s Hiroto and MUCC’s Tatsuro. They are planning to release an original work in the future. Another breakthrough came in the form of the V-ROCK FESTIVAL09, which was broadcast worldwide through the internet. This gave foreign fans an idea of their live shows, and introduced new people into the sound of jealkb. This group of comedians is on its way to stardom, having worked hard from the beginning they are steadily gaining popularity.